I use mine around the house. They cut so clean and easy. I haven't found anything they can't handle yet! My shears took a beating during my deployment to Afghanistan. Top quality, solid construction. 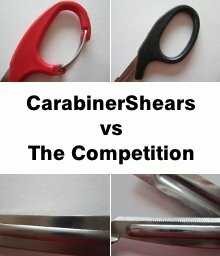 Unlike those cheap ones you'll find laying around, carabinershears' blades won't bend under pressure. Trauma shears are an essential for medical and EMS professionals. Finally there is a convenient way to have your shears always available. Don't lend your CarabinerShears to anyone. You'll NEVER get them back. If I had a nickel for every time I've heard, "Who's got shears? ", in the ER or the operating room... You know how it goes. I love my Carabinershears, because they are always right at hand. I ALWAYS have shears when I need them. CarabinerShears™ are a made of superior quality surgical steel. They’re built to last, and give you years of dependable service. These are not the cheap disposable shears you’ll find around the Emergency room. So choose a color you like, you’re going to have them for a long time!